Enhancing and combining physical imaging technologies such as MRI, CT, PET, SPECT and ultrasound permits the extraction of anatomical and functional information leading to better diagnoses. Early and differential diagnosis increases the effectiveness and safety of treatment. Techniques that can visualize individual living cells – and even the molecules in those cells – reveal the mechanisms behind the development of diseases. Tracers that attach to tumour cells make them easier to see, so the surgeon knows precisely where to operate. Image processing technologies also assist surgeons while the operation is in progress, displaying the operating area with great precision using minuscule cameras. Almost all of the research projects being conducted by Dr Botha and his colleagues involve collaboration with clinical partners. “We sometimes look at problems principally from a technical perspective,” he says, “but in general there’s always a clinician or a medical researcher involved.” Their work includes developing new techniques for pre-operative planning and intra-operative guidance, such as their research into shoulder replacement surgery, clinical diagnosis (for example in detecting polyps in virtual colonoscopy) and in medical research, such as using diffusion tensor imaging to visualize neural connections in the brain. One of the research Lines in which much progress has been made is research into shoulder replacement surgery. These are operations in which parts of joints affected by arthritis are replaced with artificial components, which often help to reduce pain. Such operations do often cause complications that can limit or even worsen the mobility of the joints. The researchers have developed a pre-operative planning system for shoulder replacement operations, to help surgeons avoid these kinds of complications. The system makes use of an automatic planning function, based on calculations of characteristic orientation points on patient-specific surface models, generated using data from CT scans. Guided by an intra-operative guidance system, the surgeon can carry out the procedure in accordance with the preoperative plan. A Leiden University Medical Centre (LUMC) researcher, Peter Krekel, has already obtained his PhD with research on this subject and is currently developing the pre-operative planning system Articulis for the market in the spin-off venture Clinical Graphics. Surgeons can use this system to draw up an operation plan and run a simulation of what a joint’s freedom of mobility is expected to be. This gives orthopaedic surgeons a good basis for making surgical decisions. In addition, in a project for which STW NIG funding has recently been secured, Dr Botha, Dr Edward Valstar (LUMC Orthopaedics and Delft University Mechanical Engineering) and Prof. Rob Nelissen (LUMC Orthopaedics) and two PhD students will be researching how shoulder replacement operations can be conducted using patient-specific instruments, which are automatically configured for each patient on the basis of the pre-operative planning. This means there is no need for an expensive and time-consuming tracking system in the operating room. The instruments make it possible to use computers to plan and help secure a successful outcome for the operation. Lucas van Vliet heads the Quantitative Imaging (QI) group of the Imaging Science & Technology department. “We invent novel solutions for biomedical imaging from molecule to man,” explains Van Vliet. We invent novel solutions for biomedical imaging from molecule to man. One research aim is to develop less invasive screening methods, such as virtual colonoscopy. This technology aims to identify polyps – the precursors of colon cancer - based on 3D CT images. “Currently, patients have to undergo colonoscopy,” says Van Vliet, “which is bothersome to patients: they have to take laxatives, and many find the examination to be embarrassing. Cardiovascular diseases are among the main causes of mortality in the Western world. The “Heart in 3D” project aims to integrate information from different imaging techniques (MRI, CT, CTA, PET, ultrasound) to facilitate personalised disease management. Associated research lines being followed by the Radiation, Detection and Medical Imaging group focus on detector technology and luminescent materials. The detector programme is developing innovative scintillation-based sensors for (time-offlight) PET and for high resolution SPECT. The materials programme, led by Pieter Dorenbos, focuses on the development of new materials for the detection of ionizing radiation. 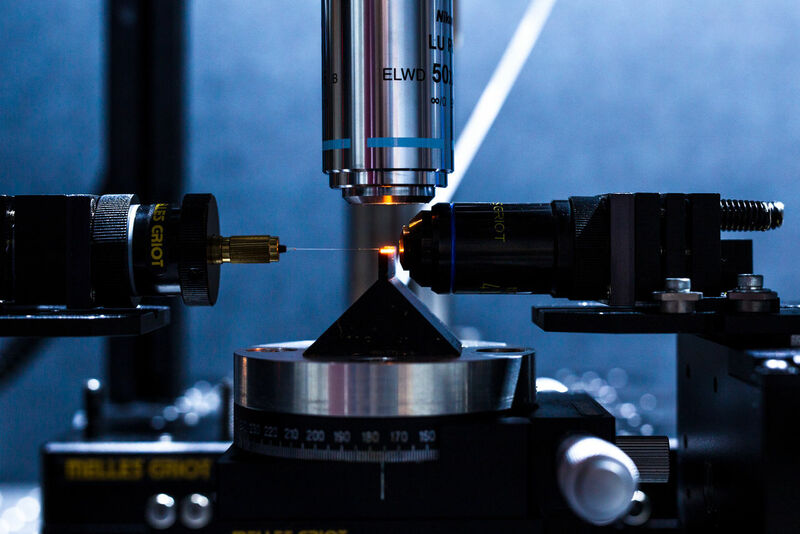 These new materials assist in the development of higher density, higher light output, or faster response scintillators that can be applied in novel CT, SPECT and PET devices. 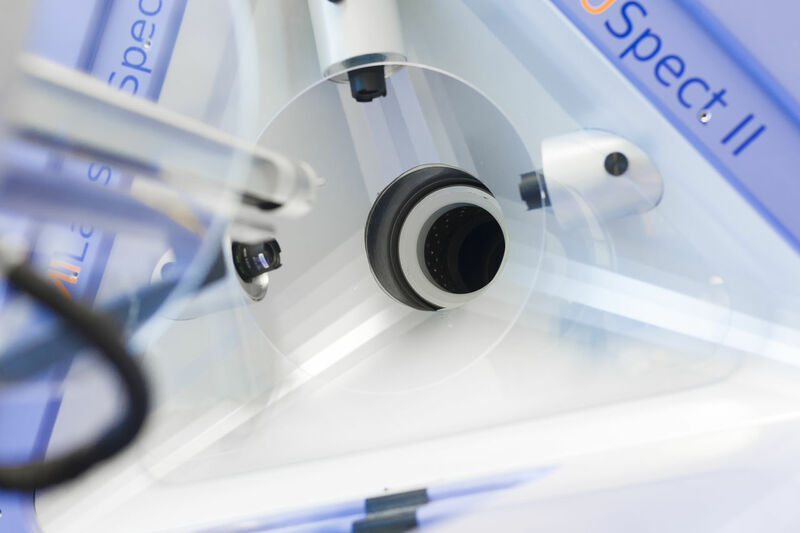 SPECT systems currently in use in medical centres have a very low spatial resolution compared with the latest devices developed by Beekman’s group. “Our U-SPECT scanner is a kind of ‘Hubble telescope’ for biologists doing basic research on how molecules distribute over tissues in the body . Now the exciting challenge is to develop the same very high resolution in clinical imaging. We’ve shown what can be done with these machines with small animals, using them to help develop the ideal tracer molecule that can be combined with a therapeutic isotope to destroy a tumour. There are already examples in nuclear medicine where combinations of tracers and isotopes have been developed to do the same in humans.” Using future human-scale versions of U-SPECT offers the prospect of much more effective diagnosis and treatment without the disadvantages of surgery and other traditional therapies. Beekman and his team at TU Delft are now developing new collimation, reconstruction and detector technologies to provide further improvements to the U-SPECT (Ultra-high resolution SPECT) scanner he developed. Tracer and therapeutic molecules have long been developed using PET and, more recently, SPECT scanners and laboratory rodents. U-SPECT scanning produces images with a much better resolution and associated quantitative accuracy than small animal PET. This enables drug and tracer accumulation to be monitored in subcompartments of organs or in tiny parts of tumours in mice or rats. A recently developed version of the device is now fully integrated with a high throughput, low dose X-ray CT scanner. This allows molecules to be examined at the sub-half-mm resolution level, and to localize them with the same accuracy in the anatomical framework.